The needs of museums are shifting: Instead of merely being places of display, they are becoming places of interactive learning that promote multidisciplinary, synthetic ways of thinking. Many institutions like the CADE are also shifting the definition away from the passive to the active tense with the mission to expand creativity and empower individuals. Employing the strategy of the intersection, we envisioned the diverse programs as interlocking units of a whole. Choices and views are maximized both through axial and diagonal paths so that visitors can customize their experience. Like triggering synapses in the brain, each time one visits the museum a new experience can be created and new itineraries made. 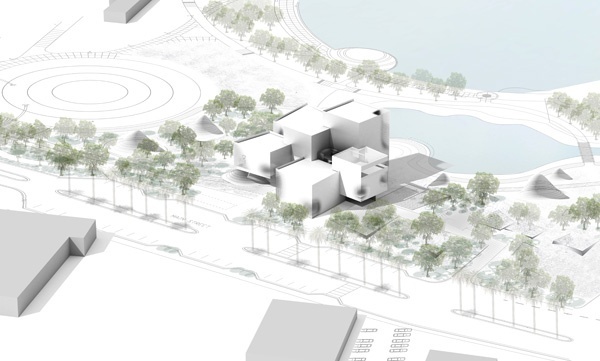 While the first phase of the museum is 25,000 sf, this abstract patterning of spaces also allows for the subsequent phases of expansion that maintain a sense of the whole while providing spatial diversity. 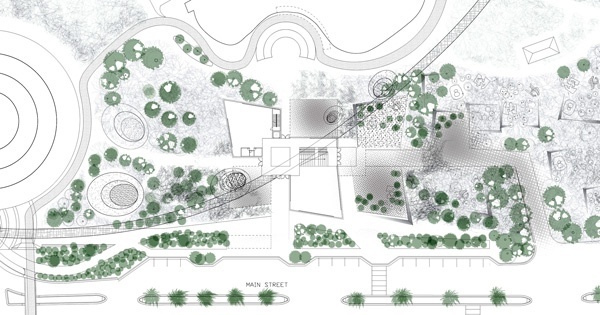 Voids and diagonal views link the experience to adjacent park areas and public pedestrian ways. Program Blocks: Exhibits are placed in a matrix that allows the users to curate and relate ideas. Key intersections work like the brain’s synapses: moveable translucent partitions can reconfigure the museum’s experience and circulation. The panels themselves become project screens. 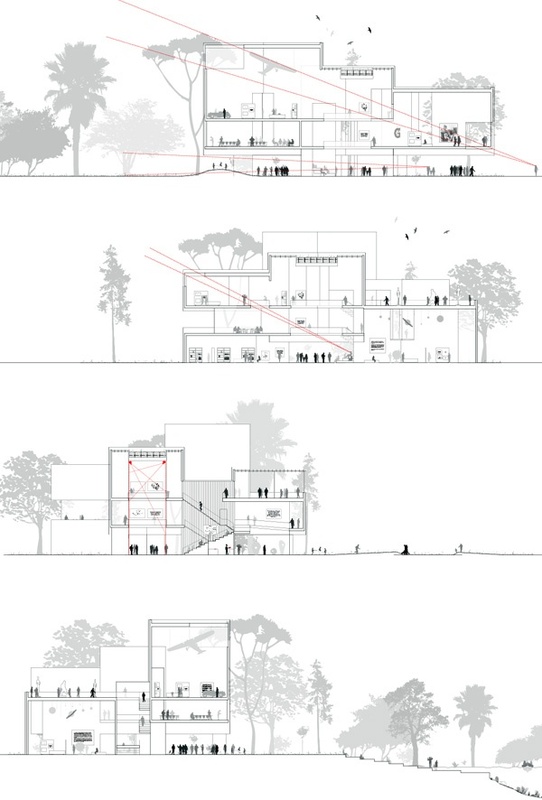 Both in plan and section, the strategic overlap and lifting of volumes allows for both direct and diagonal relationships and views. Wasteful corridor space is eliminated allowing the visitor to creatively assemble their own experience. 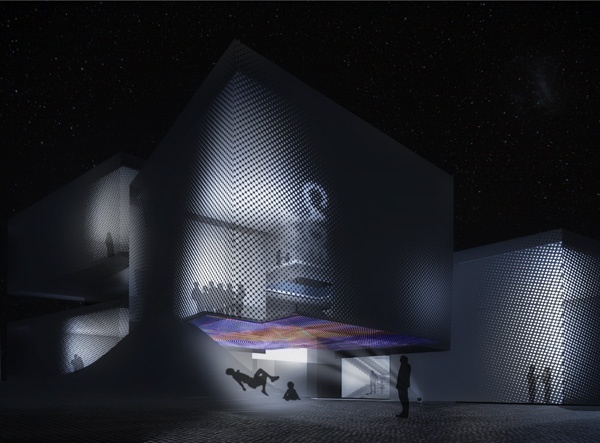 The tall and abstract travelling exhibit space allows for maximum flexibility while linking visually to adjacent spaces and the landscape beyond. The aggregation of volumes provides shaded outdoor spaces allows for future expansion while keeping the core idea of the museum intact. 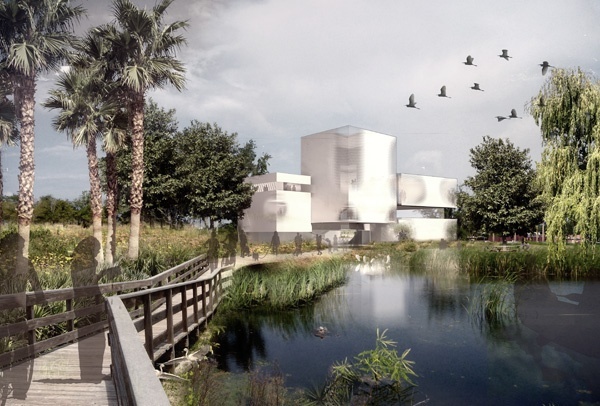 The museum links with porous views to the existing park and provides areas of shade and invites passerbys with areas of shade and rest. A perforated double skin shades the building and creates a convective air current between the inner and outer layers saving 23% in cooling costs.